PART ONE: THE ESSENTIALS - what you need. Sounds simple, but this may turn out to be your first stumbling stone. In fact not many of us happen to have an olive tree, let alone a whole grove in our backyard. True I do, but it didn't come for free. 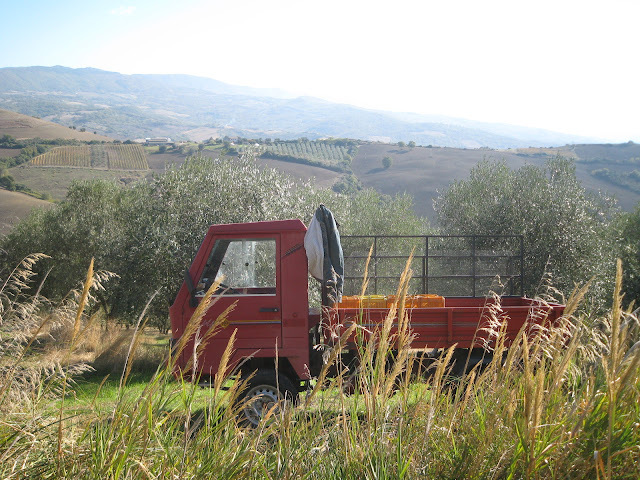 Only the making of two children with an Italian gained me life-time access to a stubborn Tuscan family and their respective olive grove. But what a grove! What are you prepared to do for yours? 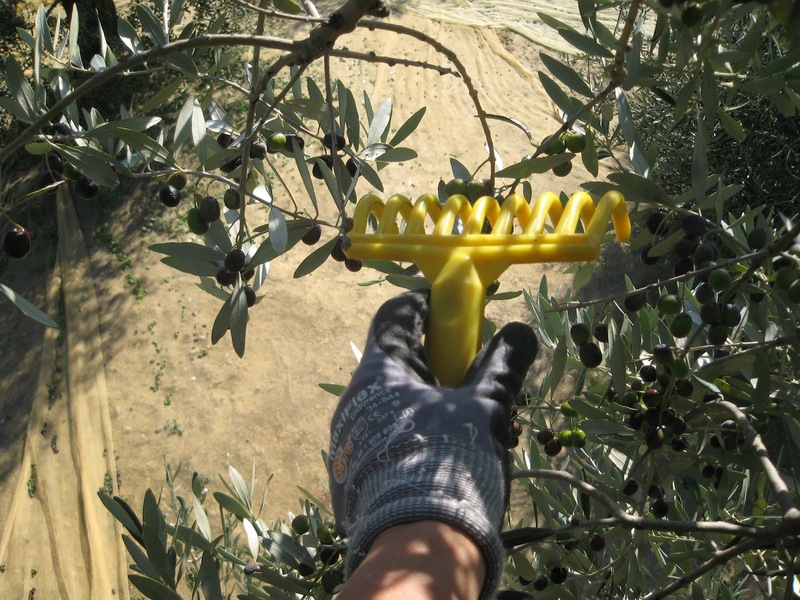 WORKING UTENSILS: Once that olive grove is settled you'll need the proper tools. The higher the better. But make sure you are still able to lift them up. It does help, when you move from tree to tree. 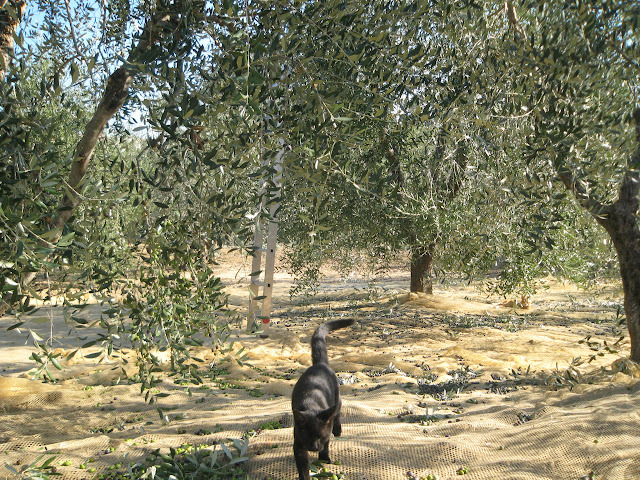 Similar to truffle dogs, they are great at finding the ripest olives. No, obbviously not. 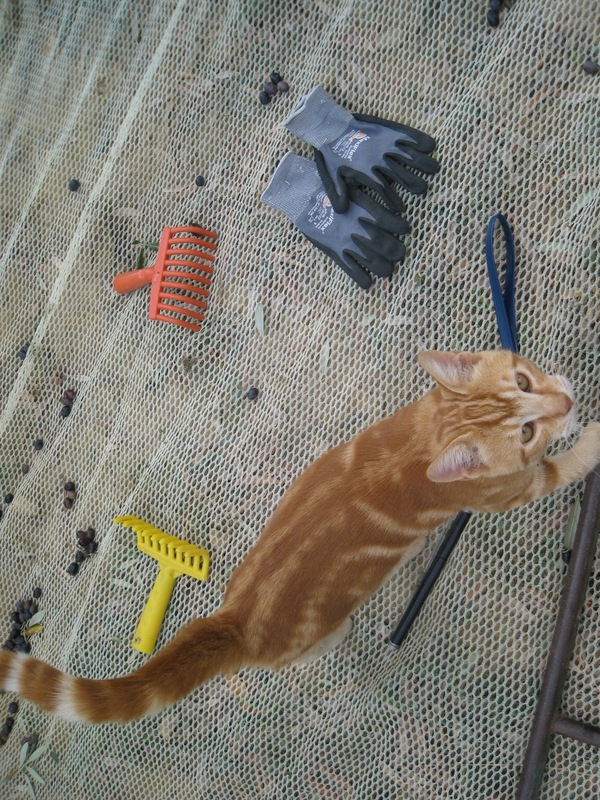 Cats are utterly useless when it comes to olive picking. 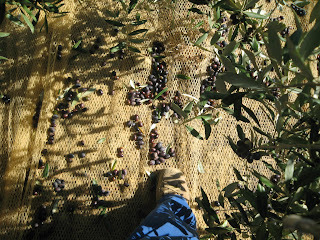 Also olives don't have to be all that ripe to be picked. When it comes to extra virgin olive oil, it's the earlier the better. At least that's how it's done in Tuscany, so as to produce the typical green oil with its very low acidity. A few comb-like tools are of help to work your way trough those olive-laden twigs. And investing into a good pair of working gloves is sound advice for people who are more accustomed to stroke keyboards than trees. 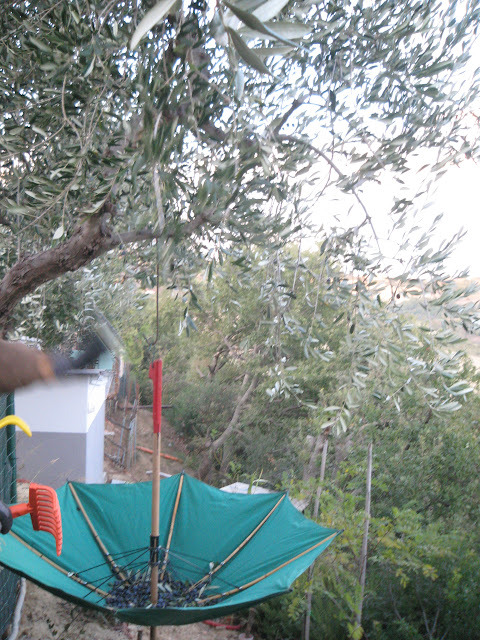 Or how in the world are those olives supposed to get to the olive press? 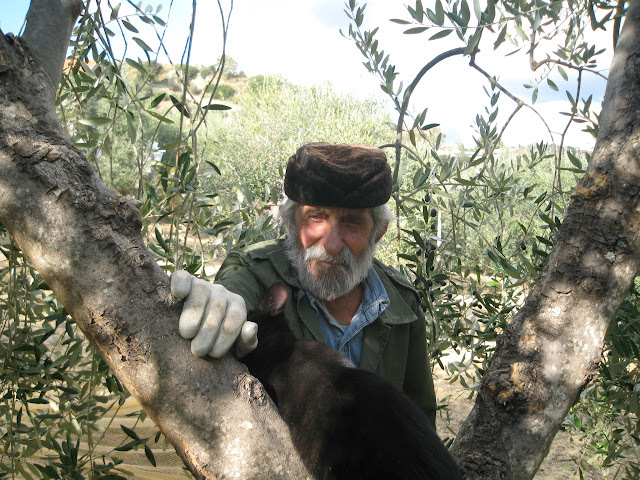 MY VERY OWN TUSCAN FATHER-IN-LAW. 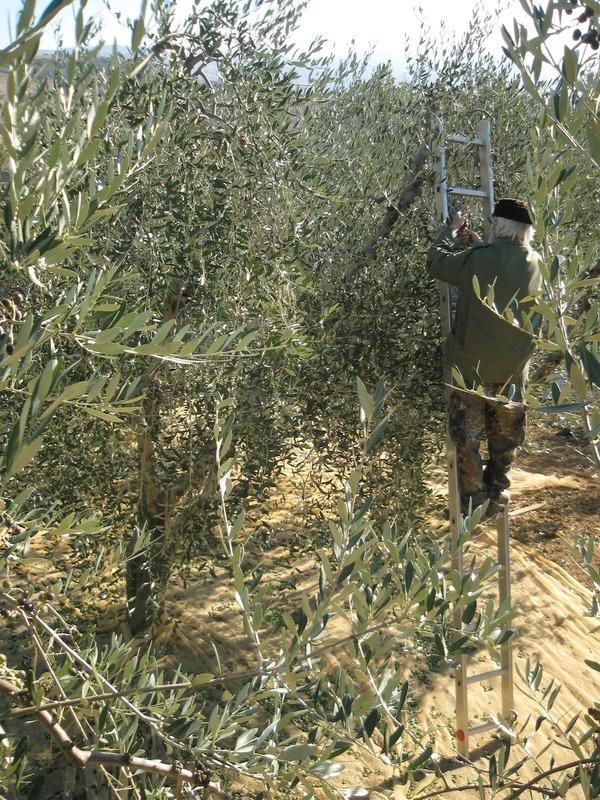 No better guide to get you trough that olive tree jungle! Make sure yours is as patient and understanding as mine. It can take a while to get the hang of that ladder technique. Sound positioning is important. 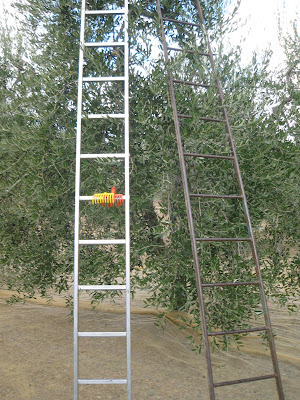 You don't want the ladder to slip or fall through the tree with you hanging on to it. Doesn't sound too difficult? 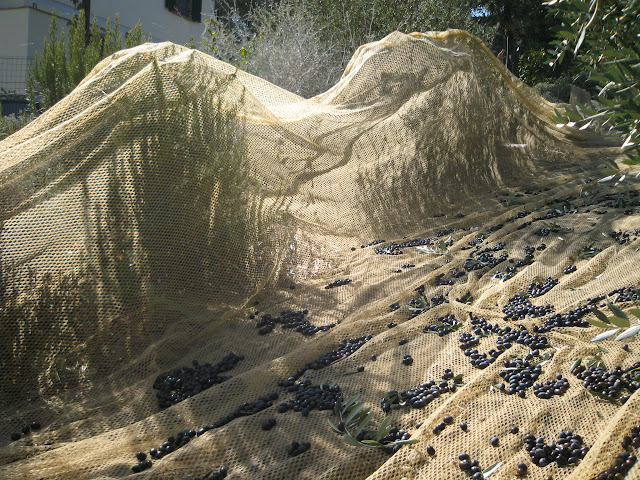 Say, have you ever visited an Italian emergency ward during olive picking season? PART 2: ARRIVE PREPARED - Physically and mentally. 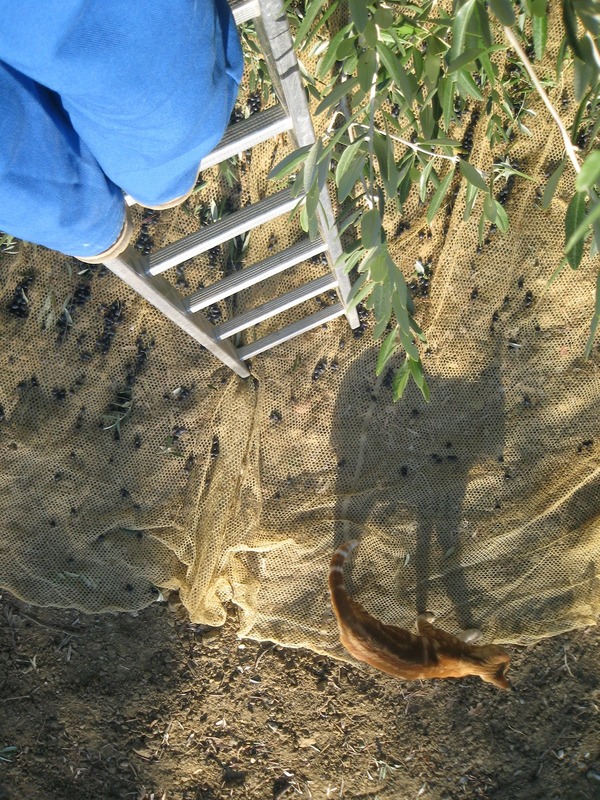 Oh dear, that basket does look far away - am I getting too far up? The view up on that ladder is beautiful, isn't it? 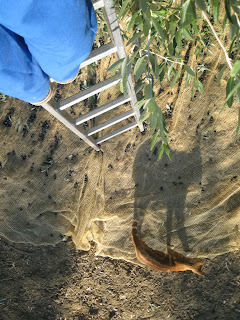 Just remember that you'll be standing on that ladder til sunset - so shall we get a move on? Sometimes not even a ladder will help. 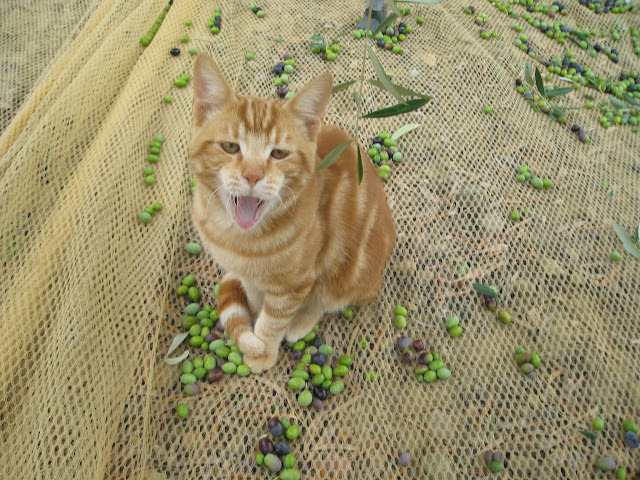 Some olives are just too far away - and they know it! "Leave something for the birds!" are the wise words of my father-in-law whenever he observes me hanging off a tree in a bit of an awkward fashion. And yes, make sure you have proper insurance. Spot the olives. How many can you see? 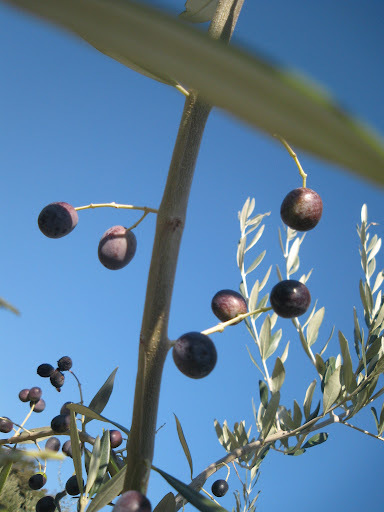 I love this type of tree with its green olives looking like miniature lemons. I think it must be of the Frantoio variety. 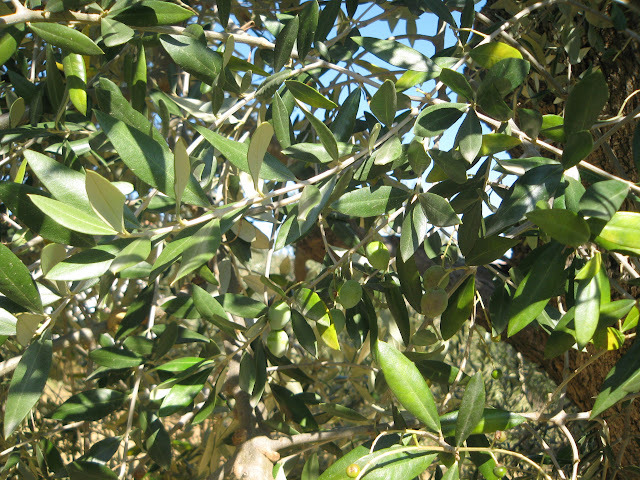 In any case it's our olive grove's queen tree when it comes to camouflaging it. 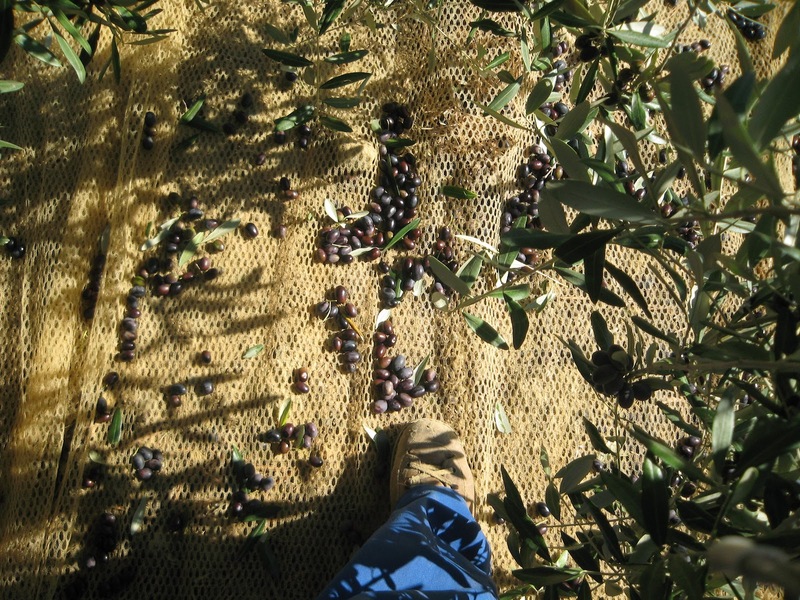 Picking is made much easier by other olive tree cultivars which are already covered with black olives at this time of the year (e.g. the Leccino variety). 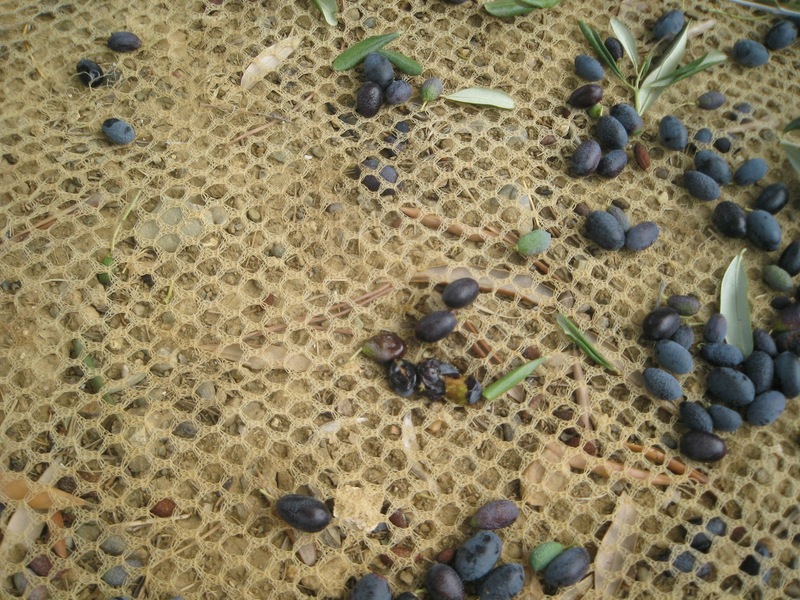 Who squashed those olives? Oh no - me? again!? That was one hell of a tree - and look at the result! 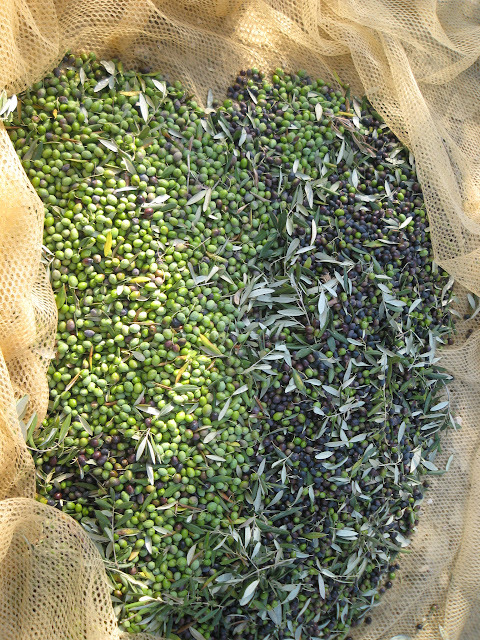 Did you see that heart of olives too? 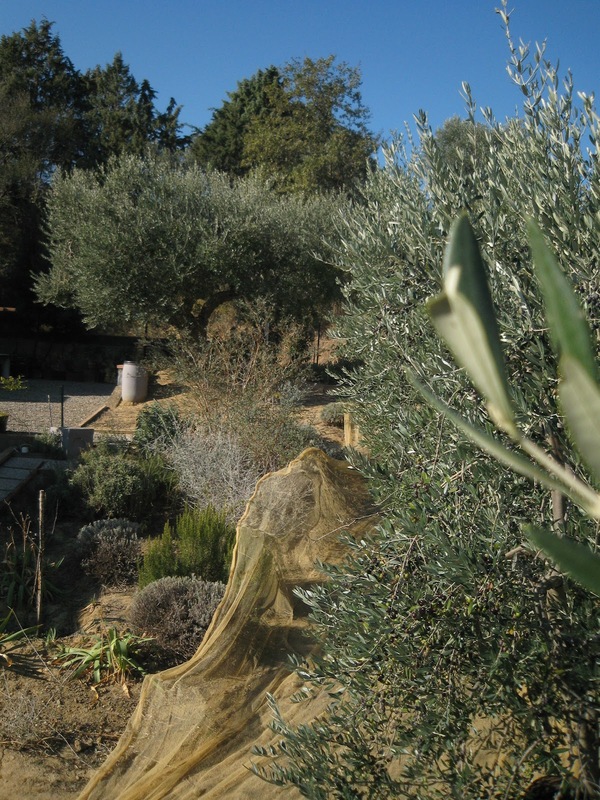 Olive trees have been known for centuries as peace bringers and olive groves in general have quite the sacred touch to them. 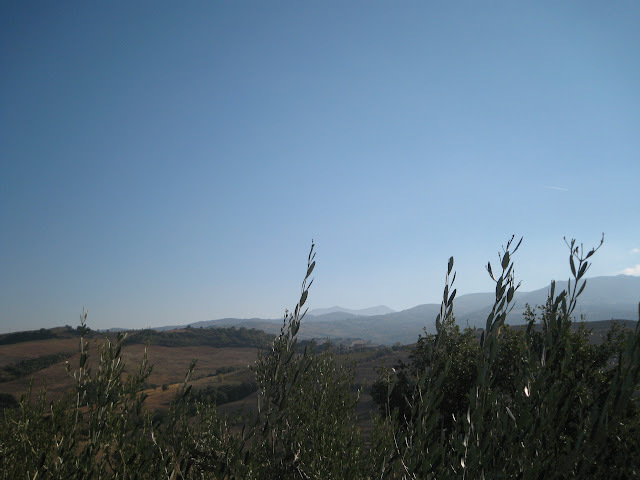 Nevertheless don't feel you have to share every single thought and deep insight with that Tuscan father-in-law. At least mine can do without. 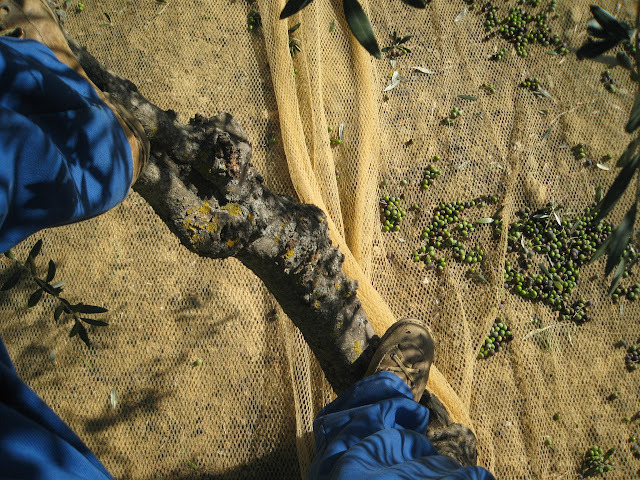 Tree climbing - remember the fun of it? Know the hierarchy in the olive grove and don't fuss with the boss. Still sure you want to give it a try? 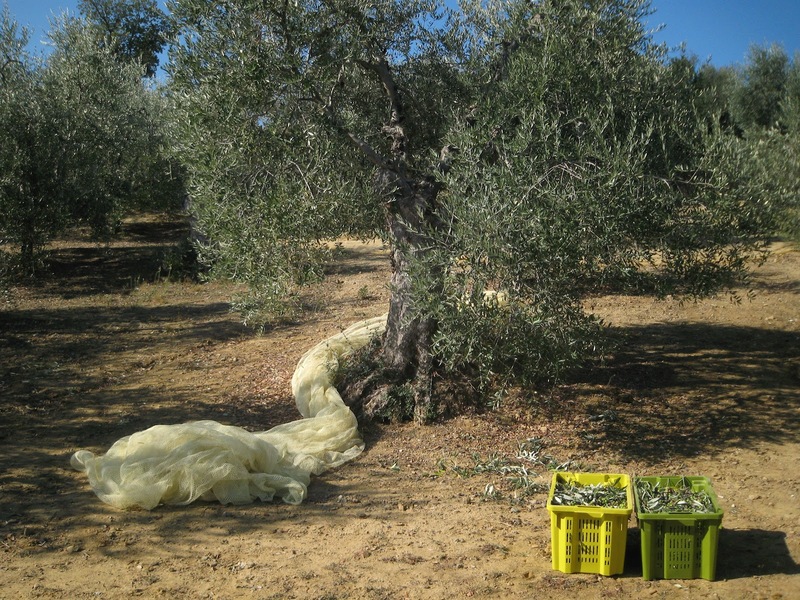 Before you buy an entire olive grove or marry somebody just because of their access to one, consider an olive picking holiday or volunteer picking on an organic farm as a WOOFER. 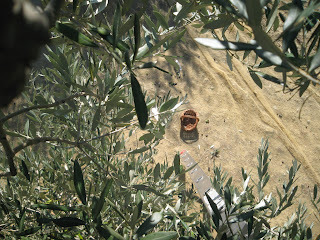 In case I managed to discourage you - there is still the option of adopting an olive tree. It's simple, no legal implications (not even in Italy!) and you don't even have to fly out, as the oil from the adopted tree will be delivered to your door. Neither will you have to put up with being bossed around by a Tuscan cat. 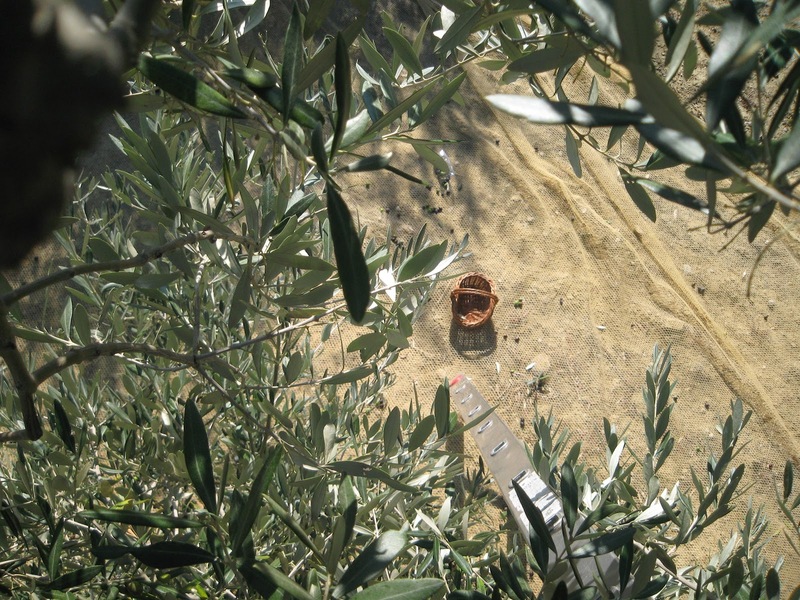 For olive tree adopting via one of Montalcino's top Brunello di Monatlcino producers check out Il Palazzone's Club 100 program.